Well, aren't ya'll just loving all the new stuff from My Favorite Things? 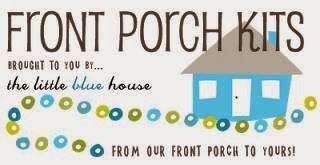 Welcome to the MFT Blog Hop and Shop! 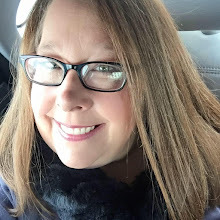 You should have roamed over here from Lisa's blog, but if you just happened pop in, you might want to see all the MFT goodness by starting over on Kim's blog. There's so much new stuff, you'd be remiss to not check it all out! The MFT DT rocks!! Ok, the next stop on this hop is FRANCES! I know she's going to rock your socks, too, so tell her I said Hi!! SUSIE Q-TIP: When you just want a little bit of ribbon accent rather than a bow or ribbon all the way across the card, try making one of these embellishments and just glue it on. I punched a circle from the orange cardstock and poked 2 holes in it, resembling the button. Then just run twine up from the bottom through the two holes, making sure to include the scrap of ribbon underneath the "button stack" so that it gets tied on the bottom. Tie a knot or bow and trim the end of the twine and ribbon to your liking. Hot Glue is your friend when you are ready to adhere it to your project. Do we need a tutorial? That is a great card, and a great little tip about the ribbon. Thanks for sharing your talent with us! ACK! How cute is this Susie! Love the colors you put together! LOVE your card and the colors...thanks for the tip too..I'll have to try it out because I love the look it gives. Such a cute card! I love these bright colors and Fred always makes me giggle! Lovely card. I must say that I just enjoy following your blog. Your work is awesome. Thanks for sharing ideas on this die-namics!! This is incredible Susan! I just love the colours on here! Oh how cute!!! Stinkin cute!!! well done and thanks for the inspiration. 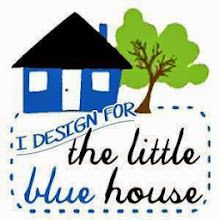 How very cute I love your work always love your work you have such great eye for color and putting it all together. thanks for the inspiration and for sharing. LOVE this!!! 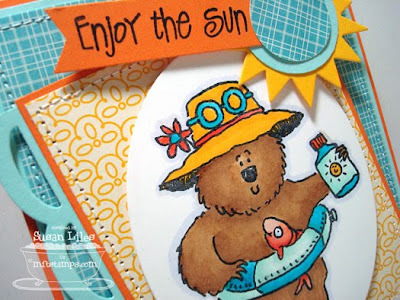 Love the papers, the layout, the sun & the border die on the side & of course fred... Mr. Bear is set up in a perfect fun bright summery scene.... awesome card! How absolutely adorable is this?? Such a summery card! Woohooo!! Love this BEAR!!! great card!! So very summery!!! Love it!!! There are SO many things I like about your card. The color scheme and the layers are the first that grab my eye! 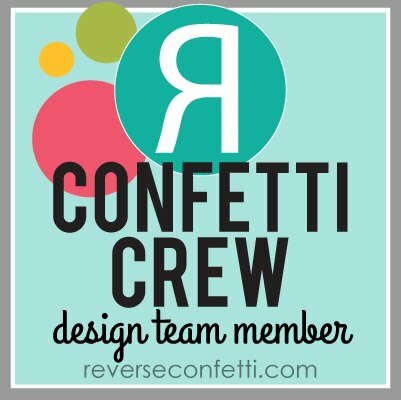 I also LOVE how you used the blue toned patterned paper on your sun! What a fresh idea! Thanks s much for the inspiration. So cute! Love the layout, paper, just so fun! Aaaaaw he's so cute. Love that jumbo scalloped die....awesome. Love the open jumbo die. So cute. WOW this is so adorable!!! 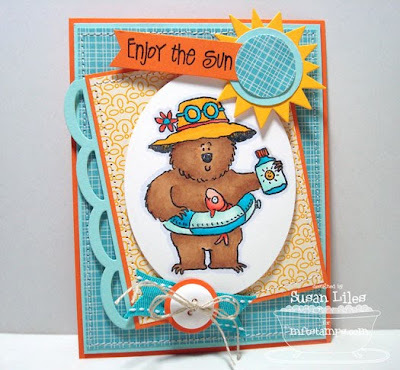 Love this cute image, great colors and fun layout! LOVE LOVE LOVE this Sue! FAB layout and papers!! love your ribbon tip! sometimes just that little bit is all you need! OMG! your card is just the CUTEST! one of my fave color combos right now. Love your card! Those papers together with that adorable beach bear and all your details all add up to an irresistable card! OMGOSH this card is stinkin' cute! I love your coloring and that border is awesome! Love it! How Sweet is this card!!! I love how you did the sun, it's perfect!! You are super talented! I love coming and stalking your blog! Oh, this card is so fun!! Love how you did it. I just love this image. It makes me want to head to the beach! So perfectly adorable, Susan! Love the aqua and orange together - perfect for summer! That is a super neat ribbon/button embellie! Thanks for explaining how to do it.